As the first step of creating Statis-Pro cards for the upcoming season, I tackled the toughest part first, the fielding. Learn to play Statis-Pro Baseball in 5 minutes by clicking here. You can access all player cards here. An exciting aspect of Statis-Pro Baseball is the chance of a defender needing to make or blow a clutch play. If playing with dice, this only applies if men are on base and instead of a number by the PB spot on the Fast Action Card comes up or in the dice version the 20-sided die comes up as a "20" and the two 6-sided die equal between 5 and 9. Learn to play Statis-Pro Baseball in 5 minutes by clicking here. Note: The opposite PB: BD or dice roll of "20" and 6-sided die between 2 and 4 ind indicates clutch batting. 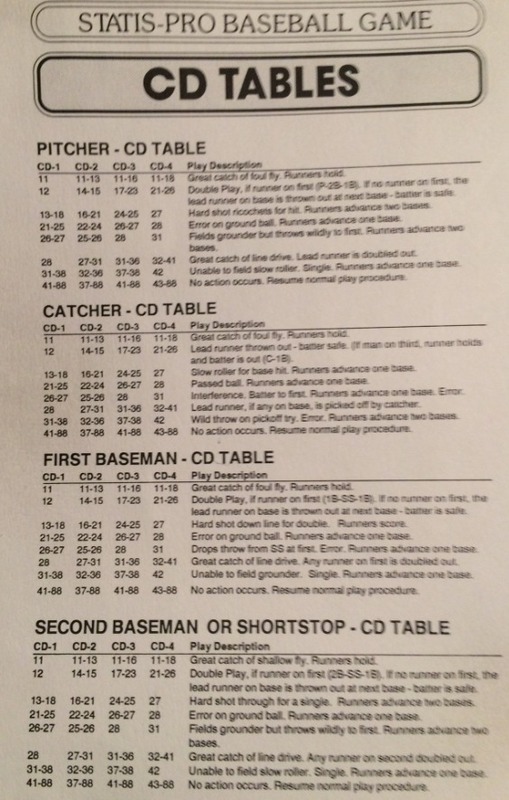 If you do not have cards with clutch batting numbers, then flip again and refer to the batters card but translate; 1) a single on the batters card to a base-clearing double, 2) a double into a home run, 3) a triple or home run on the card stay the same, and 4) anything except a hit on the card is changed to a foul home run and return to normal play with the same batter still up. When a CD is called for from the first paragraph, the next step is to determine which fielder will try to make a great play, or perhaps misplay the ball. In the dice version, the combination of the two six-sided dice determines which player, but in the Random Card version another card must be flipped and the position by the "CD" determines which player attempts to make the play. On a Random Number of 81-88 no action occurs, unless a player is a CD-5 or CD-0 (anyone playing out of position is an E10, CD-0 at that position). If an 81-88 occurs for a CD-5, it is always a diving catch for an out and runners hold. If an 81-88 occurs for a CD-0 it is always a ball misplayed into a single. The following is a list of all players who have played the field in the last three Major League Baseball seasons, listed in alphabetical order. Error (E) rating. First each player has an overall Error rating of E0 (never makes an error) to E10 (makes an error on at least one in every 10 balls hit to him. That will be his rating at every position unless you play him at a position that is not listed, in which case he is an E10, or you pick a position at which he has an (E5) or (E8) which indicates you must increase his Error rating to that number if it is not that high already because he only played a few innings at that position. Throwing Arms. Infielders and pitchers do not have separate ratings for Throwing arms. A catcher can have a TA for an excellent arm that can discourage or throw out opposing basestealers, a TB indicates a good arm, and a TC is mediocre or worse. The best outfielders throwing arms are T5 down to the worst, a T2. Clutch Defense (CD) Finally, the positions the player can play is listed along with a number that indicates who good a fielder he is, or his Clutch Defense Rating in the game, with a -4 indicating a great fielder down to a -1 indicating a poor fielder and if an (e5) or (e8) is listed that means he is a CD-1 but also played very few innings at that position and thus must have his error rating increased to a 5 or an 8 if playing that position even if his overall E number is lower. Here is how we calculated these numbers. CD-5: The only players given the best defensive rating, a CD-5, are players who have won multiple gold gloves. CD-4 (e.g. P-4, SS-4 or any other position): A player can get this in one of three ways; 1) he is nominated as one of the three finalists for a Gold Glove at this position at least one of the last three years; 2, FanGraphs FSR rating from people watching him play the position is a 10 or higher; or 3) he had one of the 10 r so best DRS (Defensive Runs Saved) ratings at that position over the past 3 seasons. CD-3: If a players does not receive a CD-4 in the step above, he can still receive a strong CD-3 rating at a position if his FRS subjective rating is a 3 to 9; or 2) if his DRS puts him in about the 25 best players at that position over the past three years. 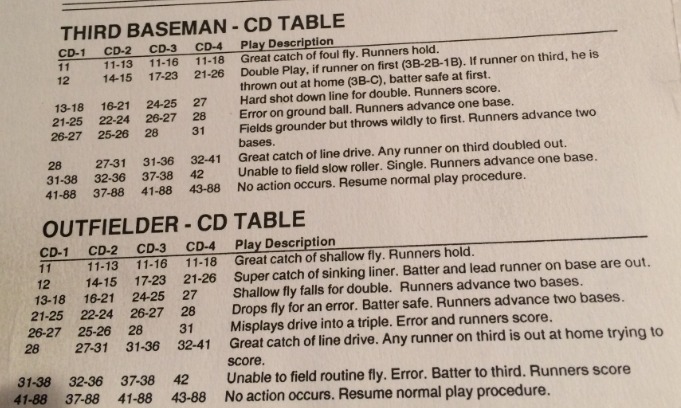 CD-2: If a player does not receive a CD-4 or CD-3 in the steps above, he can still get a CD-2 if he has a positive FSR or DRS. CD-1: If only the -1 appears by a position for a player, then he is a below average player at that position but he can field the position and just make Errors based on his E rating listed first. CD-0: The only players we give a CD-0 defensive rating is someone who plays out of position. (E5): Indicates the player was only at that position for less than 200 innings over the last year (or 100 for pitchers) and therefore if playing that position he is not only a CD-1 but also will make an Error on a 5 through 10 even if his E rating is lower overall. (E8): Indicates the player had fewer than 100 innings at the postion, and therefore his E rating must be raised to at least an 8. (E10): Is never listed, but if you choose to play a player at a position that is not even listed below, then he has an E10 rating and any potential error on him will turn into an error. Click here for Statis-Pro cards on all players based on their projected performances in 2019..